Born in Paisley, he was articled to James Lamb and trained in the Glasgow office of William Tait. In the early 1860s he moved to Liverpool and Manchester before settling in London, where he worked in the office of C H Howell, the Surrey County Surveyor. He made his name with a design for a wooden marquee commissioned by Lord Elcho for the National Rifle Brigade, which endeared him to the nobility and gentry, and prompted him to establish a practice at 19 Exeter Hall, Strand, specializing in designing country mansions, town houses and churches. Amongst these are Haseley Manor, Warwick (1875); Peebles Parish Church (1885-7) and the additions and alterations to Gosford House, Lothian (1891). In London he designed Chelsea House, Cadogan Place (1874), and competed unsuccessfully in the South Kensington Museum Competition of 1891. 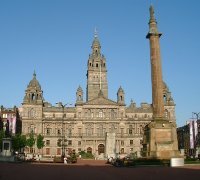 His most important building in Scotland is Glasgow's City Chambers, on the east side of George Square, which features the largest sculpture scheme in the city (1881-90). Winning the second of two controversial competitions for the building, his designs were submitted under the motto Viola (after his wife's name, Violet) and were almost destroyed in a fire at 8 Ingram Street, on 22 December, 1881, when the plans were on public display. Spread across the building's four facades, the sculpture and ornament symbolized aspects of the city's industries and her commercial and cultural prowess, as well as the power and authority of the City Council, which is embodied in the sheer scale of the building. Young's collaborators on the building's sculpture were George Anderson Lawson,of London, the project's Master Sculptor, who modelled the figures and other ornaments; James Alexander Ewing, of Glasgow, who carved the pediment and finial group; and a host of sculptors and carvers from Glasgow and further afield, who did the rest of the carving. Numbered among them were Glasgow's Edward Good; Charles Grassby; and J & G Mossman, the doyens of Scottish architectural sculpture, who had the lion's share of the work; and London's Farmer & Brindley; and William Aumonier, both of whose precise contribution is unrecorded. In 1886, Young re-designed the building's pediment as a grand, sculptural memorial commemorating Queen Victoria's Golden Jubilee. He replaced his original scheme, which depicted a central figure representing Glasgow 'with the Clyde at her feet sending her manufactures to all the world', with a multi-figure group representing 'Queen Victoria seated on her throne and her subjects from all parts of the world coming to her with their homage and congratulations'. Young also paid tribute to another sculptural icon that was being built across the Atlantic at the time, the Statue of Liberty, in his choice of pose for the statue of Truth, which stands at the apex of the Jubilee Pediment with figures of Riches and Honour reclining at her feet. 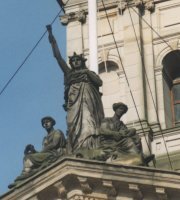 Like her American cousin, Truth holds a burning torch in her raised right hand and wears a diadem of sun rays, and is dressed in a long classical gown; not surprisingly, she is now known as Glasgow's Statue of Liberty. The building's interior also became renowned for its splendour and the richness of its decor and sculpture, which includes magnificent staircases and mosaics by Galbraith & Winton; caryatids by John Mossman ; relief figures by J P Macgillivray ; copper panels by William Shirreffs ; and dazzling polychrome tilework by Burmantofts. Young also designed the gold key with which the Queen opened the building in 1888. 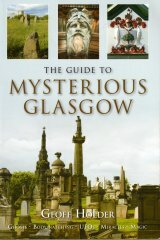 From 1873, Young was the editor of Spon's Architects and Builders Pocket Book, and amongst his own publications is Municipal Buildings of Glasgow (1890). His last building, the New (now Old) War Office, in Whitehall, London, was completed by his son, Clyde Young (1900-6). City Chambers, South Elevation - Cochrane Street.